GE is offering discounts on its GeoSpring 50-gallon heat pump water heater which, combined with Chelan PUD’s rebate, makes the cost of these units comparable to traditional storage water heaters. A $400 markdown at the store combined with the PUD’s $300 rebate drops the price by $700, making the final cost around $500. Promotions at individual stores may drop the price even lower. Lowes, for example, has a discount running through Sept. 7 that drops the final cost to around $299. Participating stores are Lowes, Sears, Ferguson and some independent retailers. The promotion runs through Dec. 3. For promotion details, visit GeoSpring.com. Heat pump water heaters can be installed by a homeowner. Use this tip sheet for do-it-yourself installation. Or find a contractor here. • Type – Tier 1 units like the GeoSpring are well suited for unconditioned spaces, such as garages. Tier 2 units are well suited to colder climates and can be ducted to move cool air generated by the unit to the outside, allowing for installation in conditioned and unconditioned spaces. • Space – Tier 1 units like the GeoSpring require at least 1,000 cubic feet of air flow around them. This is the equivalent of 10′x10′x10′ of space. • Sound – Heat pump water heaters generate sound similar to an electric fan. If your existing hot water heater is silent, this may be bothersome at first. • Cold air – While in operation, heat pump water heaters release cool, dry air into the surrounding space. • Size/height – Heat pump water heaters are slightly larger than standard electric water heaters. Learn more about heat pump water heaters at smartwaterheat.org. 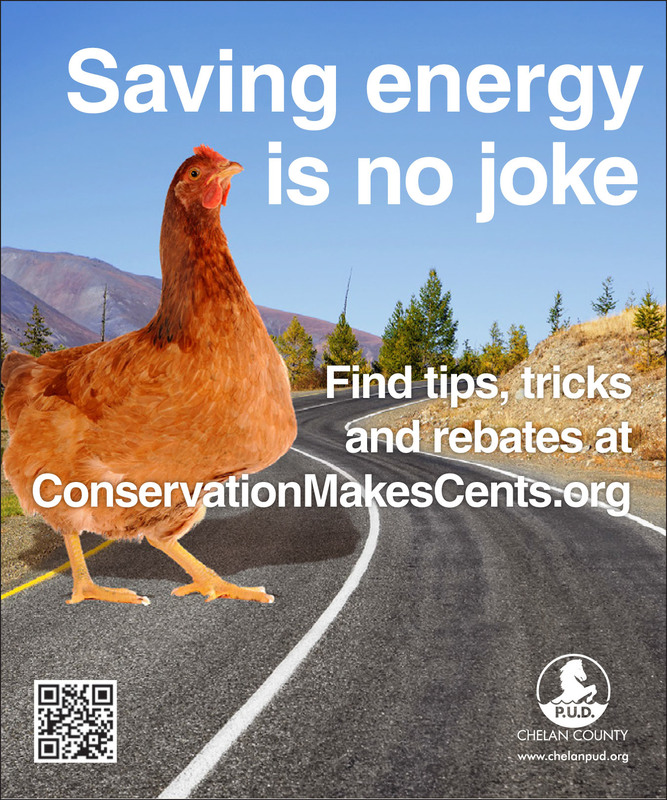 Remember to apply for Chelan PUD’s rebate. 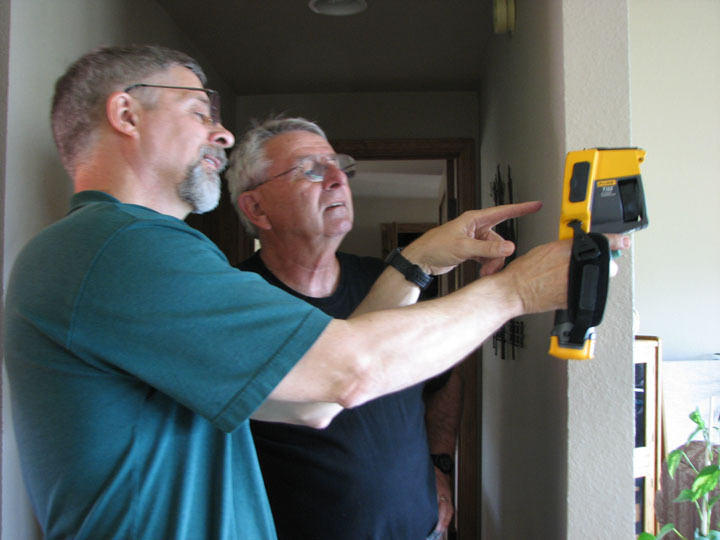 Greg Jourdan shows homeowner John Eder how a thermal imaging camera finds cold spots in his home. It’s all for a good cause. Greg Jourdan, an energy consultant and Wenatchee Valley College instructor, navigates through local homes upon request to sleuth out wasted energy. He starts by using diagnostic equipment, including a gun-shaped thermal imaging camera, to identify places where energy is being lost. 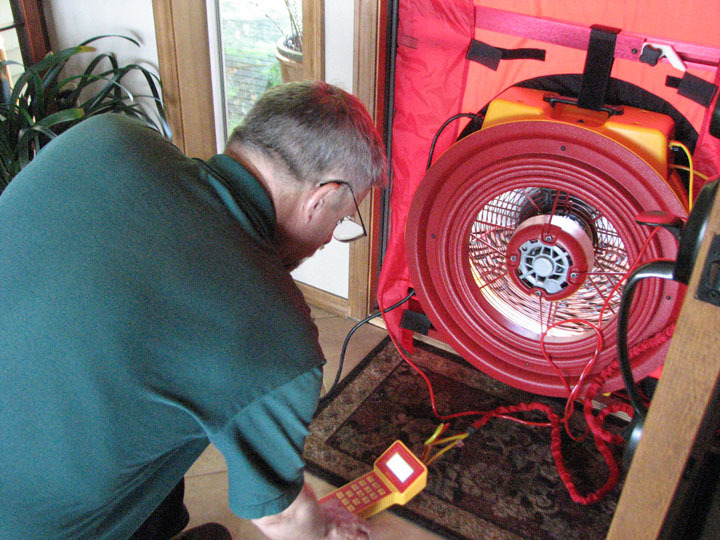 He supplements his investigation with a big blower fan that he sets up in an exterior entry door to create a large negative air vacuum in the home, to find the air leaks. Then he does a complete walk-through, looking at a home’s insulation, windows, ductwork, heating and cooling, lighting, electronics and appliances. To finish, he issues a report that includes recommendations on how homeowners can make improvements. John and Linda Eder welcomed Jourdan into their home earlier this month. The Sunnyslope couple won Chelan PUD’s drawing for a free home energy audit at the KPQ Home and Garden Show this spring. Although it’s 26 years old, their home rated high on Jourdan’s scale of efficiency. The Eders have upgraded to vinyl-framed windows and have adequate insulation. They’ve replaced the incandescent bulbs in their recessed fixtures with LEDs, taking advantage of Chelan PUD’s rebates. 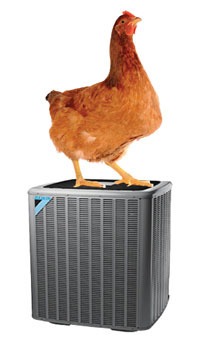 They use a heat pump for heating and cooling, and just had it serviced. This fabric door and fan create negative pressure in the house to help measure air leaks. The Eders use more electricity than might be expected because they heat and cool John’s workshop, bringing their total conditioned space to 3,600 square foot. But on a watts-per-square-foot basis, their energy use is relatively low. • Set the thermostat for cooling as high as possible while maintaining reasonable comfort levels while home. Set it to 84 degrees when away from home, or install a programmable thermostat to do that automatically. • Replace air filters every two to three months or as needed to keep the indoor unit coil clean. • Reduce the temperature setting on the water heater to 120 degrees or less. • Install low-flow showerheads in bathrooms. • Wash clothes in cold water whenever possible. • Minimize use of spare refrigerators and freezers. If not needed, consider recycling through Chelan PUD’s free recycling and rebate program. You can perform your own energy audit by following this checklist. Learn about professional home energy audits here. Jourdan can be reached at gjourdan@msn.com.